A small compound in Gwadar town’s old area is littered with coils of polyvinyl chloride (PVC). Around six workers calibrate a moulding machine mounted inside a parked truck and pass the coils through it. Pipes of different diameters and sizes come out from the other side. This is Gwadar’s first pipe manufacturing plant. The rudimentary contraption belongs to a famous PVC pipe manufacturing company based in Karachi. All its workers have also come from Karachi. There is no other machinery here. No engineers in protective helmets oversee the manufacturing processes. No clerks or administrators run the facility’s day-to-day affairs. The place is as humble as any other compound in town. And the pace of work here is leisurely. The plant’s operations are part of a 300-million-rupee sewerage project for Gwadar inaugurated on April 15, 2015. The scheme, envisaged during the tenure of former Balochistan chief minister Dr Abdul Malik Baloch, includes the laying of several kilometres of PVC pipelines to carry storm and sewerage water from the town’s streets and roads to three cemented wells located at different places on Gwadar’s outskirts. From these wells, water will be pumped to a treatment plant located in the foot of Koh-e-Batil, the mountain that rings Gwadar port on one side. The treated water will be used for developing and maintaining green belts. Construction and mechanical work is complete at the treatment plant; wells for waste water storage have also been built. The rest of the sewerage system is only partially built. An inauguration plaque at the treatment plant states that the whole project is to be completed by April 2017. That does not seem likely. Local residents complain the pace of work on the project is very slow and is causing problems for them. The process of burying the pipes underground, for instance, has ruined the few metalled streets that existed in Gwadar, says Khuda Bukhsh, head of the Rural Community Development Council (RCDC), a local community-based organisation. The ones that were not metalled have turned into potholed dirt tracks, he says. Many local residents believe Gwadar Development Authority (GDA), the government agency executing the project, is neither competent nor efficient. The quality of work also leaves a lot to be desired. Materials and technology being used are rather elementary, some local residents complain. Others point out design flaws: Bukhsh says pipes – with a diameter 12 inches – are being laid to drain storm water that requires pipes of much bigger size. Many local residents believe Gwadar Development Authority (GDA), the government agency executing the project, is neither competent nor efficient. It is known for not completing development schemes, says Muhammad Ishaq, a general councillor of Gwadar Municipal Committee. The authority is also known for letting completed schemes go to ruin, he adds. Ammanullah Askani, a senior engineer, exhibits maps and slides on a projector screen at the GDA office to explain how Gwadar has been divided into several zones for laying sewerage pipes and storm-water drains. Streets are narrow inside the old part of town, he says. Mechanical shovels cannot be employed here, he adds, so the work is being done manually. That is what is causing the delay, he argues. When there was no port in Gwadar, the town’s limits were confined to what is now known as the old town. A master plan that the GDA created for Gwadar’s expansion in 2005 showed the whole old-town area as part of the port. As per the master plan, a number of housing projects and markets were conceived to replace the old town. That foretold the fortunes of the Gwadaris living here: they were to relocate whenever the port was expanded to its fullest. The old town was to be shifted about eight kilometres to the north where the coastal highway to Karachi starts (or ends), Askani says. 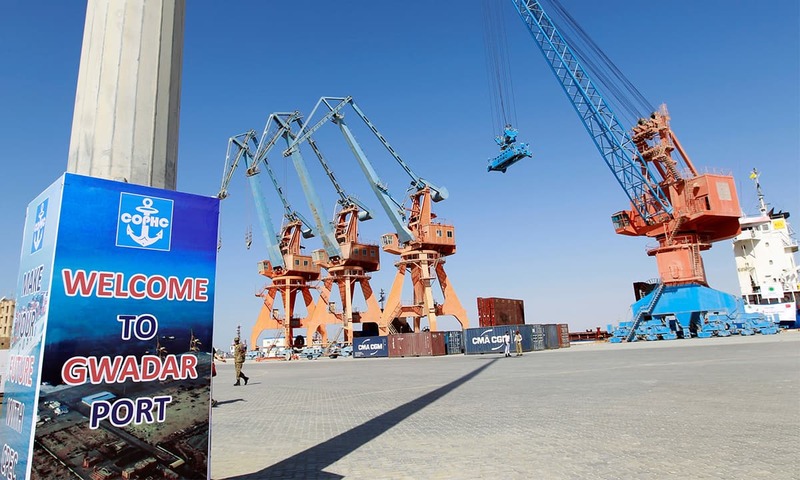 Now the old master plan has been scrapped and the federal government has assigned a Chinese company the task to create a new one for what is being called Gwadar Smart Port City. No officials in Gwadar can say if relocation of the old town will form a part of the new master plan as well. Yet, two development schemes that are already well under way – the construction of an expressway to connect the port with the coastal highway and the expansion of the port – will have a definite impact on the future of the old town. Dostain Jamaldini’s friends believe he was punished. The then Balochistan chief minister Dr Abdul Malik Baloch made him chairman of the Gwadar Port Authority (GPA) in the winter of 2013. At the time, Jamaldini was working as the finance secretary, one of the most powerful bureaucratic positions in the provincial government. On the other hand, there was almost no work at the authority and its headquarters in Gwadar was hundreds of kilometres from the provincial capital of Quetta. Jamaldini’s friends felt sorry for him. They thought he had landed a dead-end job. Three years later, he finds himself at the centre of Pakistan’s most talked-about development plans — of turning Gwadar into a 21st century hub of regional and international sea trade. 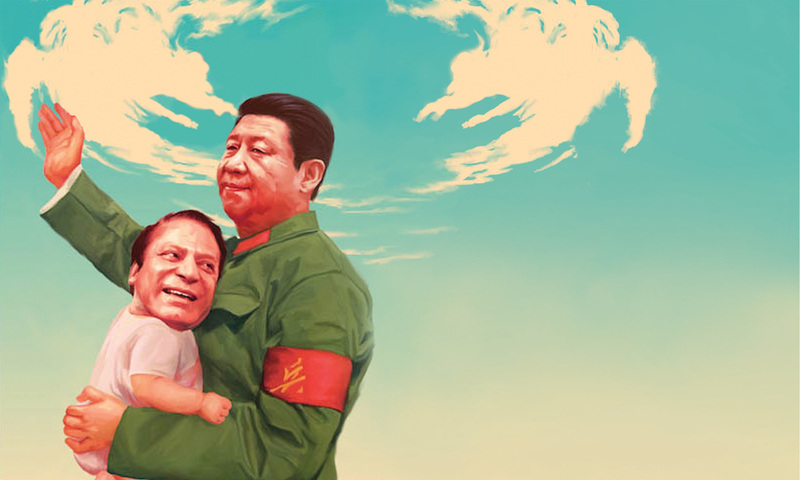 He spends more time attending meetings in Quetta and Islamabad – sometimes even in Beijing – than in Gwadar. His friends now envy him. Jamaldini is also one of the busiest men in Gwadar. As GPA’s head, he is handling a number of important development projects — an expressway, a tax-free zone, a vocational training institute, expansion of the port and the creation of a business complex. Regular visitors to Gwadar immediately notice that the work on these projects is one of the few signs that demonstrate the difference between the town’s past and its present. 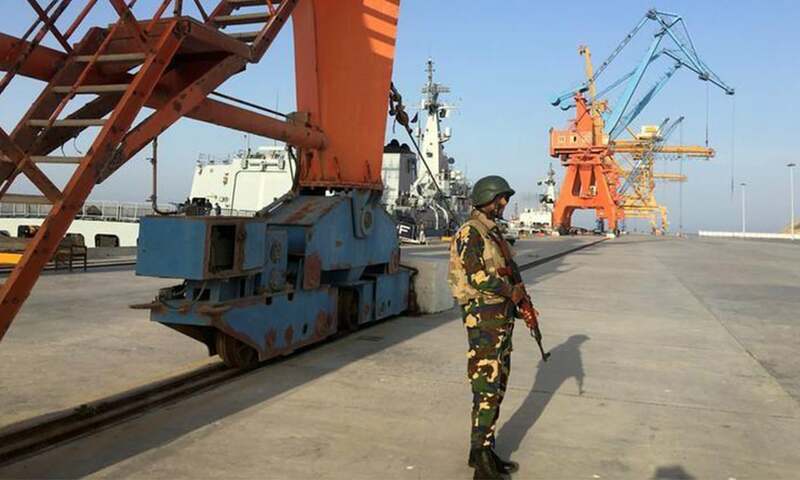 Others include an increased presence of security forces and their armoured vehicles, particularly near and in the port area, and a dual-way metalled version of the old, narrow track called Fish Harbour Road. It has been renamed as Marine Drive. Local residents claim all these schemes were conceived and designed years ago. Most significantly, they say, these have not materialised because the much-hyped China-Pakistan Economic Corridor (CPEC) has come to town. Nasir Sohrabi, a local development activist and an RCDC representative, says some other projects – including parks, a sports complex and a hospital – also predate CPEC. Away from these projects, life in Gwadar goes on as usual — at the same old lazy pace, along the same old dusty roads and streets. Most of the town remains as much a slum as it always has been — devoid of all civic amenities. Electricity is intermittently available for less than 12 hours a day and tap water is supplied only two hours a week. The electricity shortage makes Akhtar Jan Mengal, a former chief minister of Balochistan and the head of the Balochistan National Party-Mengal (BNPM), extremely unhappy. “The entire Makran division [of which Gwadar town and Gwadar district are parts of] is provided electricity for only six hours a day,” he says. The total electricity that Balochistan needs is hardly 1,600 megawatts but it is getting only 300 megawatts, he says. The gap between the supply and demand of water is similarly glaring. Akra Kaur Dam – built in 1995 over an area of 17,000 acres about 22 kilometres to the north of Gwadar – is the main source of potable water for the town. It has been drying up for the last two years due to less-than-usual rains. The town also has two seawater desalination plants — one in the private sector and the other set up by the government. While the former, according to a recent report in daily Dawn, is selling “100,000 gallons of drinking water to the public health engineering department daily”, the latter has been out of order for years. The one-billion-rupee government plant has the capacity to desalinate two million gallons of water per day but requires a huge amount of money for its repairs. A hearing of a Senate standing committee recently revealed that it needs up to 700 million rupees “for its repairing and reoperation”. The gap between the supply and demand of water is similarly glaring. Akra Kaur Dam – built in 1995 over an area of 17,000 acres about 22 kilometres to the north of Gwadar – is the main source of potable water for the town. The major source of water supply to Gwadar these days is Mirani Dam, more than 170 kilometres north of the town. Tankers bring water from the dam to a pumping station, run by the public health engineering department, which then supplies it to local residents. Mengal remarks: “Gwadar and its rural suburbs have been facing extreme water shortages for the last five years but nothing has been done to solve the problem.” There is a lot of talk about desalination plants, he says, but nobody is saying how much electricity is needed to run them and who will bear the cost of their operations. Jamaldini acknowledges that Gwadar requires an improved water supply and also needs to have an uninterrupted power supply if it wants to succeed as an international port. No businesses or industries will want to set up shop in the town as long as the two problems persist, he says. Gwadar has two development authorities, GDA and GPA, and an elected municipality. The three entities have overlapping jurisdiction, making it difficult to apportion responsibility for the lack of civic amenities in the town. The sewerage and rain water drainage system being laid down in Gwadar exemplifies that confusion. The GDA by-laws state that it will regulate, rather than execute, projects financed by the federal and provincial governments, yet it is the executing agency for the project. Will it keep running the project once the sewerage system and the treatment plant become functional? Nobody knows, says Ishaq, the general councillor, though the only government entity that has the human resources – essentially the sanitation staff – to keep the project running is the municipal committee. Abid Sohrabi, chairman of the Gwadar Municipal Committee, finds it hard to explain the difference between the town’s media image as the driver of Pakistan’s economy in the future and its present-day reality. He complains that GDA and GPA do not take him into confidence when implementing even small development projects. “We are left to deal with the negative impacts of development projects,” he says. Abdullah Usman, a local social activist, says most of the GDA projects are being carried out without consideration for the needs of the people. Their design and the manner in which they are operated provide little benefit to local residents, he says. Usman gives the example of a sports complex built five years ago. It’s so far from the town that people need transport to reach there, he says. No one uses its facilities. Its fields, tracks and enclosures are already coming apart as is its commercial area that was supposed to provide money for running and maintaining the complex, he adds. Likewise, a 50-bed, GDA-built-and-operated hospital – which will be expanded to a 300-bed facility under CPEC – could not start functioning till May 2016. Even though its construction was completed six years earlier. It was only on the personal instruction of former army chief Raheel Sharif that it finally started its operations. Yet, healthcare provided here remains basic, says Usman. An officer from the Army Medical Corps has been made the medical superintendent of the hospital. Other doctors have been brought from Gwadar District Headquarters Hospital and rural health centres. A couple of them have been brought in from Turbat. These doctors examine patients only in the outpatient department, Usman claims. For the treatment of serious and complicated ailments that require surgeries and hospitalisation, people have to travel to Karachi, he adds. Even routine procedures such as child deliveries cannot be conducted at the hospital because it has no gynaecologist. There is not a single gynaecologist in the entire town. Pregnant women have to be shifted to Karachi for deliveries, says Usman. The case of a local primary school is even more curious. It was recently renovated by the GPA. With funds provided by China’s Communist Party as a gift, the authority has added six new beautifully-built classrooms to it. The impact of infrastructure improvement was immediate — the number of its students swelled from 50 to 300. Yet, it does not have a sufficient number of trained teachers. The provincial government has appointed only one teacher here, says Usman, and Gwadar’s deputy commissioner has engaged two untrained teachers on a temporary basis. Weary of such lacklustre development, many local residents initially welcomed the announcement of development schemes to be carried out under CPEC. But, they say, they have become disillusioned – even apprehensive – over time. They fear new plans for the town may deprive them of their traditional sources of livelihood. Fisherfolk – who constitute the largest part of Gwadar’s population – have already been hit hard. They lost some of their prominent fishing spots with the construction of the port back in the 2000s. Now, with the port’s expansion, they will lose all of them. The town’s old fish harbour and jetty are still functional but they fall within the port’s limits and fishermen and fish traders face daily problems in accessing them because of the security checkpoints in the area. 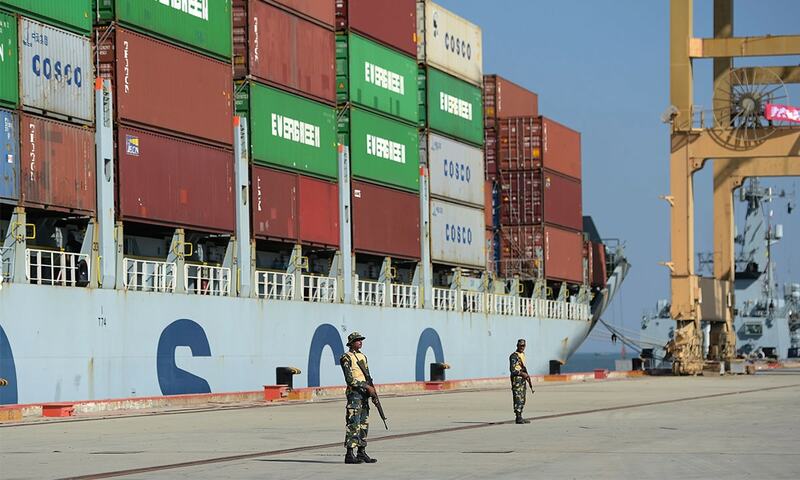 With the arrival of Chinese personnel working on the expansion of the port, security has been tightened further. Two new fish harbours and jetties are being built in the villages of Pishukan, 37 kilometres to the west of Gwadar, and Surbandar, 22 kilometres to the east of the port town. They were scheduled to be completed by 2009 but are still far from becoming functional. Even after they become usable, Gwadar’s fishermen will not be able to cover those distances from their respective homes, says Nasir Sohrabi. Some of them have abandoned the profession already, he says, while many others are finding it hard to continue. A road built as part of CPEC’s western route passes by the home of Muhammad Rehan, a 27-year-old schoolteacher. If the Planning Commission’s deputy chairman Ahsan Iqbal is to be believed, the 650-kilometre road between Gwadar and Sorab via Turbat has “revolutionised” the lives of the Baloch living along it. As the first direct road link between Gwadar and Quetta, it has reduced travel time between the two cities from two days to just eight hours, he says in an interview in Islamabad. Rehan should be “building boundary walls around [his] landed property” as so many other Baloch are doing, according to Iqbal, since their “land has become valuable” with the construction of the road. Rehan, however, has not been to his village in Shahrak union council of Balochistan’s southern Kech district for more than two years. The village was caught in the middle of skirmishes between security forces and Baloch insurgents. The latter fired at the former from within the village and then fled. Unable to get hold of the insurgents, the security forces shelled the village and took all its men with them — some of them never came back. The 'shining' Gwadar of official description seems like a mirage- on that haunts the town's residents amid security cordons, poverty, illiteracy, and economic and political marginalisation. Rehan and his family have been living in a makeshift shelter on a private compound, enclosed by low mud walls, in Turbat city for the last two years. They are among thousands of families that have migrated from the restive districts of Kech, Awaran and Panjgur. Only a few of them can afford to live in rented houses. Estimates about their numbers vary. Some locals estimate that the number of displaced people living in Turbat alone can be as high as 10,000. Many more are living in Hub town of Lasbela district, as well as in different parts of Sindh province, including Karachi. Hasil Bizenjo, the federal minister for ports and shipping who is also the president of the National Party (NP) that is part of the tripartite coalition government in Balochistan, believes the total number of displaced Baloch is so high that it will have a significant impact on the upcoming national census. Those who have migrated to Karachi and other provinces of Pakistan due to the insurgency in Balochistan should be brought back before the census takes place, he said at a press conference in Islamabad in December 2016. Otherwise, he warned, the Baloch will become a minority in their own province. These political considerations are hardly the reason why displaced people like Rehan want to go back home. They have been unable to settle down in their new environs without a proper roof over their heads and in the absence of stable sources of livelihood. He wants peace restored in his area, first and foremost, so that he can resume a normal life. “How can I think of any benefit from CPEC if I cannot live in my own home?” he asks. Peace seems as remote as ever. Statistics suggest violence may be increasing in Balochistan rather than decreasing. The number of attacks on security forces, according to Balochistan home department officials in Quetta, was higher in 2016 than in any previous year since 2011 — 48 attacks, including suicide bombings, were carried out against the police, 39 against the paramilitary Frontier Corps (FC) and 12 against the tribal border force, Levies, during the last year. Security forces have also increased their operations in Balochistan during recent times as compared to those of the past, the officials say. And the operations launched during 2014 and 2016 were not confined to the province’s Baloch areas alone; some of them were conducted in Pakhtun areas as well, says a senior official, requesting anonymity. He says security forces conducted as many as 5,600 combing operations between 2014 and 2016 and killed 470 suspected militants. The FC, which operates mostly in Baloch areas of the province, alone conducted 3,963 operations and killed 402 suspects involved in attacking security forces, hitting government installations, bomb blasts, launching sectarian attacks, committing suicide bombings and carrying out target killings, the official discloses. “The operations were massive,” he says, in comparison to the ones conducted “against banned militant outfits in Kalat, Khuzdar, Awaran, Turbat, Panjgur and some other Baloch districts between 2012 and 2014”. Other markers of violence are equally grave. The number of bodies dumped and found in Balochistan in 2016 stood at 94, according to the official. The figure for 2015 was 129, he says. There has been a decline in the phenomenon though: in two previous years (2013 and 2014), he says, the total number of bodies found from different parts of Balochistan was 371. All this violence coincides with a push by the government for CPEC’s implementation, with civilian and military authorities in Quetta and Islamabad insisting that the two are linked. Ahsan Iqbal, for instance, says 45 soldiers of the Frontier Works Organisation – the army’s road-construction firm – were killed while building the Gwadar-Sorab road. Baloch politicians and activists believe the conflict in Balochistan is not about development projects — at least not exclusively about them. Tahir Bizenjo, NP’s senior vice president, says that even the National Action Plan (NAP) against terrorism and extremism, devised in late 2014, acknowledges that there exists a “political” conflict in Balochistan. And that conflict precedes CPEC, he says. Rehan, after all, had to leave his home well before the first CPEC project in Balochistan was even inaugurated. Decent Tailors is a small shop on Quetta’s Sariab Road. It is an old establishment and is known all over Balochistan for its trendy and quality stitching. Its lone shelf is stacked with stitched shalwar kameez outfits — all placed in transparent plastic bags that carry the names and addresses of their owners, written neatly with a ballpoint. Its proprietor, Ali Asghar Bangulzai, has been missing for more than 15 years now. Ali was working behind the counter on June 1, 2000 when several double-cabin vans stopped in front of his shop. He was dragged out and bundled into a van under the scared gaze of other shopkeepers. He was released 14 days later without a charge. He was severely tortured and felt disoriented for weeks after his release, says his nephew Nasrullah Baloch who now runs the shop. Ali was then a member of the Baloch Haq Tawar Party, a political organisation set up by the Marri tribe chieftain, the late Nawab Khair Bakhsh Marri, who played a leading role in a Baloch insurrection in the 1970s. Nasrullah claims Ali met an army major during his detention. The officer was also detained but his family was told that he had gone abroad on assignment. After Ali was released, he found the major’s family and conveyed his message to them. The major was later released but soon after Ali was picked up again. Sameer turned up dead on October 9, 2011. His body was found dumped in Nilhat area near Gwadar. His family came to know about his death from news on television. That happened on October 18, 2001. He was with his friend Muhammad Iqbal on Sariab Road when both of them were taken away. He has not come back since then, though his companion was released 24 days later. As the head of an activist group, Voice for Baloch Missing Persons, Nasrullah has been running a campaign for the release of his uncle as well as other missing Baloch all these years. He has also been receiving occasional reports that Ali is still alive. In 2011, a deputy director of the Inter-Services Intelligence (ISI) revealed during the meeting of a joint investigation team held at the office of Quetta city’s police chief that it was his agency that was keeping Ali in detention. The officer is said to have told Nasrullah that the ISI will not make the mistake of releasing Ali — like it did in the case of such separatists as Dr Allah Nazar Baloch (chief of the Baloch Liberation Front) and Amirullah Bangulzai. When another missing person, whose name cannot be revealed due to concerns for his security, came back home in April last year after spending seven months in detention, he, too, confirmed meeting Ali in custody. Abdul Karim Rind left his home town, Buleda, in southern Balochistan soon after he got married in the late 1970s. Along with his wife, he moved to Bahrain where he had found a job in the police. His eldest son, Sameer, was born in Bahrain in 1983. Rind came back to Pakistan after two decades and settled in Turbat. Sameer completed his graduation from Atta Shad Degree College in the same town and was making plans for further studies when, on October 14, 2010, he was picked up from his home, allegedly by FC personnel. His sister Sumiya was a student at a Turbat college at the time. She left her studies to work for the recovery of her missing brother. Her pursuit took her to Quetta and Islamabad multiple times for participation in protests against enforced disappearances of the Baloch and to attend the hearings of a commission set up by the Supreme Court for the recovery of missing persons. All that came to naught. Sameer turned up dead on October 9, 2011. His body was found dumped in Nilhat area near Gwadar. His family came to know about his death from news on television. Reports quoted official sources alleging that Sameer was a senior commander of the Baloch Republican Army, a separatist group affiliated with the Baloch Republican Party set up by Brahamdagh Bugti, a grandson of Baloch chieftain and politician Nawab Akbar Bugti who was killed in a military operation in 2006. Sitting in her drawing room in the Gulshanabad neighbourhood of Turbat city, Sumiya points towards a flier pasted on a wall. It states that her brother was picked up by the intelligence agencies. It also carries an appeal for his release. “My brother was never involved in any kind of politics. It was only after his body was found that we heard of claims by some unknown officials that he was a senior [separatist] commander,” Sumiya says. He would not be living in his home if he had been a commander of some separatist organisation, she says. He would have been hiding in the mountains and fighting security forces like other rebel Baloch men, she adds. Six months after Sameer’s assassination, his two younger brothers were arrested by security agencies as they were returning from Ziarat after a recreation trip. They were released 20 days later without a charge. Their parents dispatched them to Oman immediately after their release so that they do not meet the same fate as Sameer did. Sumiya and two other girls living in a small rented house in Quetta’s Sariab area heard loud bangs at around 2 am on October 4, 2015. Someone was violently knocking on the door. When the girls, all university students, opened the door, the men outside introduced themselves as officials of law enforcement agencies. They told the girls to hand over their cell phones and entered the house. A little while later, they singled out Sumiya and told her to accompany them. “There was no female official around,” she says, sitting in her Turbat home. The men “made me sit in one of the several vans” parked outside the house. “Then they blindfolded me.” After an hour-long ride, she found herself in a small room with a single chair. The officer told her that her friends had been released and she would also be released, as no evidence had been found against her. “He gave me a cell phone with a single number saved in it. He asked me to provide information on that number regarding members of banned Baloch organisations,” Sumiya claims. She never used the phone. The men then blindfolded her, put her in a car with tinted glasses and left her near the area she was picked up from. Soon afterwards, she left the university without completing her education and went back to Turbat to live with her family. Sumiya now ventures out of her house only when she cannot avoid it — to buy groceries or to take her ailing parents to a doctor. [On] the night of September 16 last year, several FC vehicles stopped outside a house on the outskirts of Turbat. The house belongs to one Sartok, a peon at the town’s general post office. The officials stormed inside, looking for his son Amjad Sardar. Sartok told them that Sardar was not in and was living with his sister. The FC men told him to take them there. Sartok says he tried asking the officials about the allegations against his son but he was told to keep his mouth shut and do what he was being ordered to do. As soon as they reached his daughter’s house, the FC men barged into it. They picked up Sardar, forced him into a vehicle and drove away, says Sartok. Sardar was a pale, lanky man, just 18 years of age when he was taken away. An intermediate-level student at Atta Shad Degree College, Turbat, he used to help his brother-in-law run a medical store in Turbat bazaar. In the first half of 2016, his brother-in-law died and Sardar started living with his widowed sister. His entire day would be spent studying and running the medical store, says his father. Nasrullah is pursuing his case in court as well. He has filed a petition at the Supreme Court for the recovery of Ali and other Baloch missing persons. It was earlier dismissed for non-prosecution but has been revived and clubbed with other similar petitions filed by the Human Rights Commission of Pakistan (HRCP) and the Defence of Human Rights, an organisation run by Amina Masood Janjua whose husband went missing from Punjab in the early 2000s. Nasrullah claims the number of missing persons has registered a sudden increase in the last year or so. The number of the Baloch who went missing in 2015 was 463. This increased to 667 — most of those missing have disappeared from Makran division and the districts of Naseerabad, Mastung, Awaran, Kalat and Bolan/Sibi. Officials in Quetta see the numbers cited by him as gross exaggeration. Only 47 missing persons’ cases were lodged with the Commission of Inquiry on Enforced Disappearances in the last two years (2015 and 2016), a senior official in the Balochistan home department says, requesting anonymity. He says the total number of cases registered with the commission is 342 — out of these, 121 persons have been traced (of which 94 have reached home safely) and the bodies of 27 other missing persons have been recovered; 102 cases have been found unfit for proceedings because of incomplete particulars and fake evidence. The remaining number of missing persons cases is just 119, the official claims. The government figures seem to understate the problem. When the Commission of Inquiry on Enforced Disappearances started functioning under the Supreme Court orders in 2011, it recorded only 90 cases from Balochistan, even though human rights activists and many Baloch politicians were claiming that the number could be in the hundreds, if not thousands. That this was so became evident as the commission initiated the process of discovering people who were reported missing: after it had updates (person traced to be in custody, found dead, returned home, living abroad or still missing) on all the cases it had registered in 2011, it started receiving new complaints. The number of missing persons cases it was dealing with went up in 2013 to 122 — many of these people had gone missing in earlier years. The figure had jumped to 265 by July 2016. Abdul Hafeez Jamali has spent years in research on the anthropology of globalisation and development. Within this broad academic discipline, the focus of his doctoral thesis has been on the history of Indian Ocean trade and the politics of identity and place in Balochistan. A professor at Habib University, Karachi, he has also worked with the provincial government in Quetta. Jamali argues that creating a Dubai-like city, with a big port, skyscrapers and a road network connecting it to all parts of the country, has been a long-held dream of Pakistani policymakers. Central to that dream was the idea to locate it in Balochistan, at the periphery of the Pakistani nation state, he says. 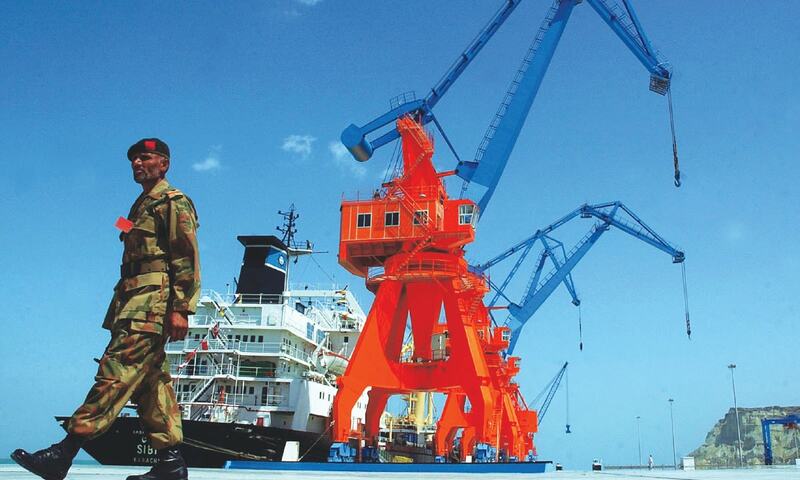 Jamali argues the projects being implemented under CPEC are a manifestation of similar dreams, showing Pakistan’s predilection for mega-development plans as a means for achieving quick economic growth. The desire has been ubiquitous among former European colonies of the global South that want to catch up with the industrialised West in terms of material wealth, physical infrastructure and other modern indicators of development, he says. Then there is a flip side to mega-development plans. Their economic, social and ecological costs are disproportionately borne by the people inhabiting the areas where those plans are implemented, says Jamali. Such mega projects are conceived and advocated by the elites, he says, and they tend to create the expectation of a quality life among the middle class. 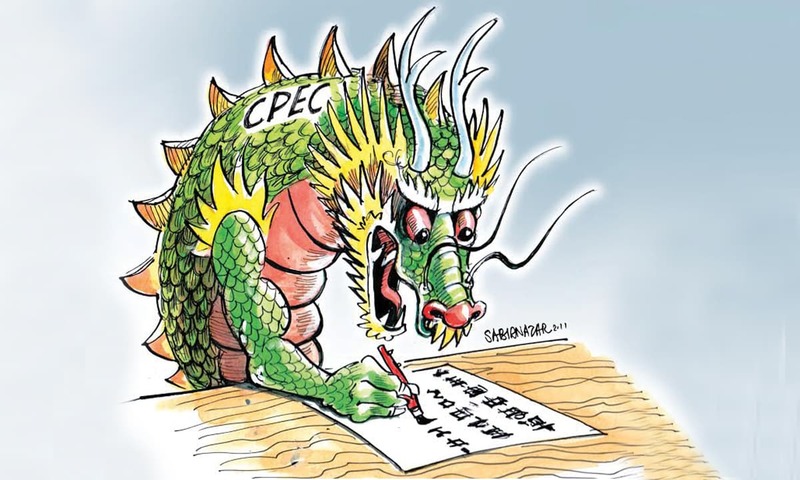 Pakistanis, for instance, are being ceaselessly told that CPEC will bring in unprecedented prosperity and improvement in communication infrastructure, besides creating jobs and boosting economic growth. If nothing else, CPEC’s focus on building infrastructure is projected to be boosting steel and cement production in Pakistan. At least one cement manufacturer has already placed an order for a new and bigger plant, daily Dawn reported on January 18, 2017. Another company is also investing 235 million US dollars to purchase a new cement plant that, according to a newspaper report, will “be completed in the next two years”. This bullish approach may need some tempering. 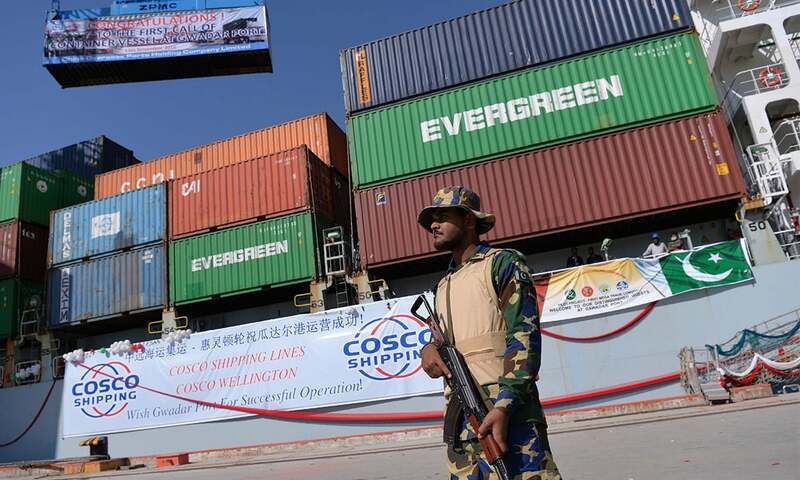 China will want to send at least some of its surplus industrial products to Pakistan under conditions inbuilt in the agreements for the CPEC-related projects. This, indeed, has happened at least once in recent months. Daily Dawn reported on October 29, 2016 that a Chinese ship, MV Chang Han Hai, had berthed at Gwadar port the previous day and had “brought construction material and equipment, including bulldozers, trucks, dumper trucks, cranes, rollers, generators, electric cables, pipes, 20,000 tonnes of cement and other accessories”. The newspaper quoted the port authorities as saying “the accessories would be used for construction work at Gwadar Port Free Zone”. While planning a deep-sea port in Gwadar, the authorities had the opposition of the local people in mind. They, therefore, felt the need to reassure themselves and their anxious audiences elsewhere in the country and abroad about the security of the project. It was portrayed to be vital to the future of Pakistan. “The public was made to understand that the dispossession of the Baloch in the wake of mega projects is not only good for the Baloch themselves but also critical for the long-term survival of the nation,” Jamali says. The public was informed that foreign powers, including India, have set their evil eyes on strategically important geographical locations in Pakistan such as Gwadar, he says. The state’s information machinery kept releasing stories that emphasised Indian “interference” in Balochistan’s affairs. One such story published on December 31, 2016 in all Pakistani newspapers said that a “dossier on captured Indian spy Kulbhushan Jadhav and evidence of attempted violation of the maritime boundary by an Indian submarine [on November 14, 2016] will be handed over by Pakistan’s permanent representative to the United Nations Dr Maleeha Lodhi … to [the new secretary general of the United Nations] Mr [António] Guterres on his first working day at the UN headquarters in New York”. The massive venture is being portrayed as the cause of the Baloch insurgency rather than the insurgency being the manifestation of some other long-standing factors. This narrative, Jamali says, has helped legitimise the militarisation of empty places such as the entire Makran division — and by extension, many other parts of Balochistan where energy pipelines and highways will be constructed. The projects in these areas have been declared “national assets which need protection”. This explains why senior government functionaries have been trying to portray an old insurgency into a new threat — an India-sponsored effort to fail CPEC, Jamali argues. The massive venture is being portrayed as the cause of the Baloch insurgency rather than the insurgency being the manifestation of some other long-standing factors. Akhtar Jan Mengal is extremely critical of CPEC’s impact on Balochistan. In their current form, the projects being devised and implemented under CPEC will be harmful to the province and its people, he says in an interview. Official figures say 1.5 billion US dollars are being spent in Balochistan out of 50 billion US dollars or so that will come to Pakistan as loans and investment from China under CPEC. 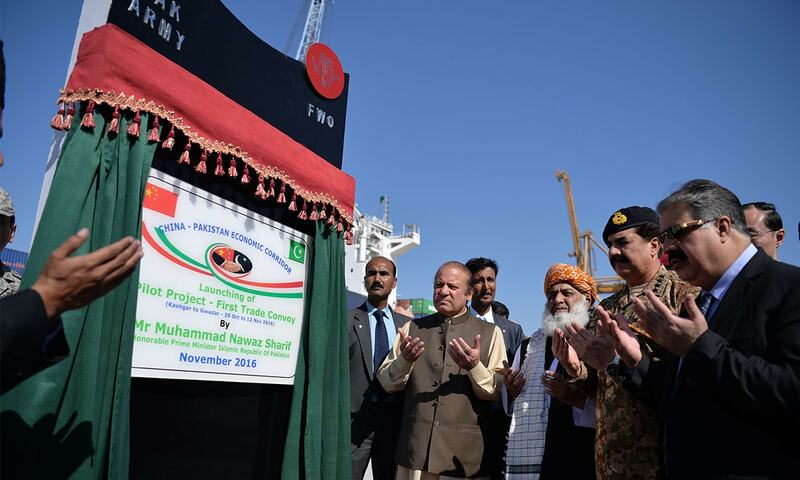 Most of the projects being implemented in the province are concentrated in Gwadar — construction of an expressway, expansion of Gwadar hospital, Pak-China Technical and Vocational Institute, a water desalination plant, two power plants with the combined capacity to produce 300 megawatts of electricity, an international airport as well as the expansion of the port. Two major projects outside Gwadar are a road – known as the western route that links Gwadar with the Karakoram Highway through Turbat, Sorab, Quetta, Zhob and Dera Ismail Khan and has already been completed – and a coal-fired power plant at Hub. The seaport, the airport and power generation plants will all be run by the federal government, Mengal says. “Balochistan’s job share in the federal projects is a tiny 5.5 per cent — for every 100 persons hired for these projects, 95 will come from outside the province.” Even for minor jobs – drivers, electricians, machine operators – the workforce will come from outside Balochistan as the locals are not trained in these skills, he says. The influx of job seekers from outside Balochistan, Mengal says, will change the demography of the province in general and of Gwadar in particular. “During the next 10 years or so, there will be a huge influx of non-Baloch people in Gwadar. The Baloch will be reduced to a minority here,” he says. He cites the example of a 1,292-megawatt power plant set up by the Hub Power Company (Hubco), a private sector enterprise, in Lasbela district’s Hub area to explain how development projects based in Balochistan do not necessarily benefit the people of the province. Who is using the electricity being generated there, he asks. The high-tension transmission lines that take this electricity to the national grid pass right above hundreds of Baloch villages that are without electricity, he says. Uch power plant in Dera Murad Jamali, another private-sector project with the capacity to produce 586 megawatts of electricity, runs on gas solely provided by Balochistan but “everybody knows where the electricity produced by it is going” — to the national grid. The conversion of Hubco power plant to a coal-fired facility under CPEC will similarly accrue no benefit to Balochistan, says Mengal. Creating a Dubai-like city, with a big port, skyscrapers and a road network connecting it to all parts of the country, has been a long-held dream of Pakistani policy makers. 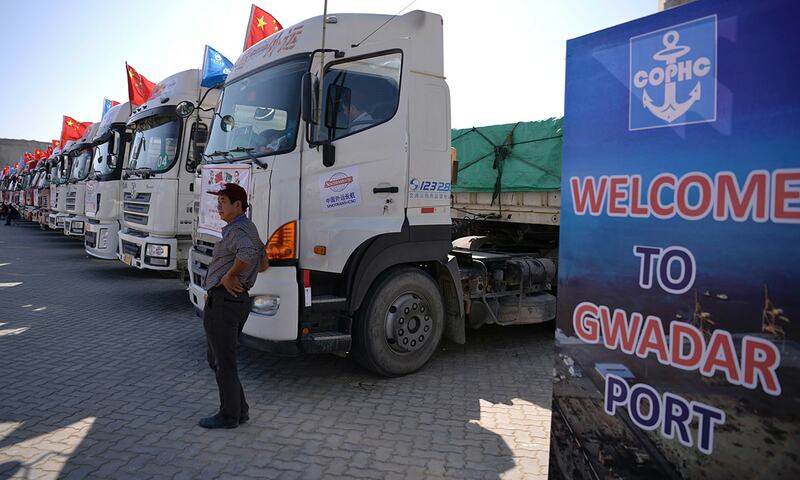 Mengal also claims the quality and capacity of the western route – as well as the security along it – are not good enough to make it a suitable road for the movement of trade convoys between Gwadar and the Chinese city of Kashgar. This means eastern routes – via the Gwadar-Karachi coastal highway and the Gwadar-Khuzdar-Ratodero highway – will be used more frequently. This also suggests that planners knew the potential of the western route and did not invest much money in it to turn it into an international-standard highway. Tahir Bizenjo says his party is not against CPEC but it has many concerns about it. “When Dr Abdul Malik Baloch (a leading member of the NP) was chief minister of Balochistan, we used to raise these concerns with the federal government,” he says. 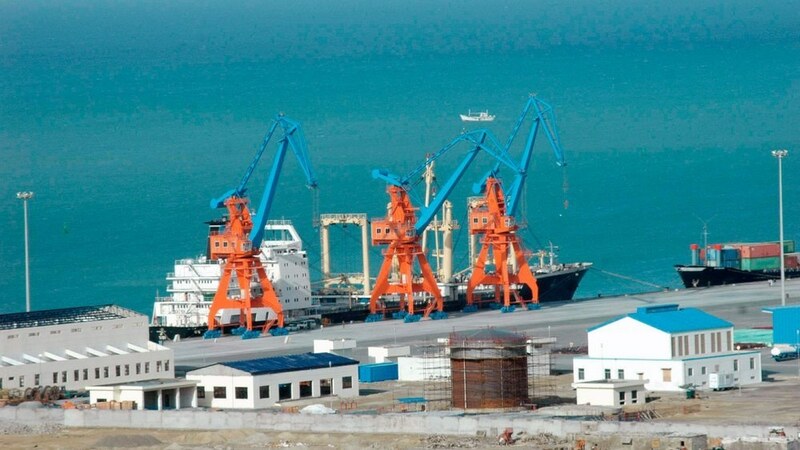 Since Gwadar is the CPEC’s gateway, Tahir says, its people must get all the civic amenities they need, without having to wait for the completion of long-term projects such as the expansion of the seaport and the construction of the international airport. He says the Baloch are rightly concerned about the influx of people from other provinces with the completion of port-related projects. The Baloch living in Gwadar in particular and in Makran division in general should be given priority in jobs, he says, to slow down – if not altogether avoid – that influx. Vocational training institutes should be set up on war footing to help local people acquire skills necessary to get employment in CPEC-funded schemes. Officials in Islamabad dismiss these arguments as political rabble-rousing. Hijazi says the western route consists of a road used mostly for smuggling or by the army for border security. “[It] also passes consistently along the slopes of mountains. Every time there is heavy rainfall, it is washed away by landslides.” Major investment was required to ensure that this did not happen again, he says. He concedes the division of CPEC funds “is not even” but quickly adds that this is due to “many factors” including population and the level of industrialisation. As a member of the Planning Commission and the Central Development Working Party (CDWP) – the highest decision-making body on mega projects – till November 2016, he was closely involved in planning new roads and power generation plants under CPEC. “Balochistan’s population is about 6-7 million – (in reality, it is estimated to be 13-14 million, maybe even more) – and [the province] has a small industrial base. Its demand for electricity is far less than that of Punjab which has a population of over 100 million.” So, he says, the government obviously needs to set up more electricity generation plants in Punjab, under the CPEC, than in Balochistan. He believes soon more routes will require similar expansion and improvement because all the existing ones will be jam-packed once CPEC-facilitated trade gets into full swing. “The Chinese have proposed a new railway track and a highway linking Mansehra [in Khyber Pakhtunkhwa] with Gwadar directly.” That route will eventually become a necessity after the existing roads fail to accommodate the traffic, he says. He insists that the federal government is not oblivious to the interests of the Baloch. To safeguard the interests of Gwadar’s local population, “I proposed that any business that [wants to] come into Gwadar should have a mandatory local partner, something like the kafala system in the United Arab Emirates.” This system can be phased out in five or 10 years “but at least it will give enough time to the locals to establish and train themselves” in business. “The government needs to provide incentives to Gwadar’s own population” for starting joint ventures with Chinese companies. Hijazi does not mind the change in Gwadar’s demographics. He expects the town’s population to reach one million people in the next five to 10 years “and about 0.9 million of these will be Chinese”. Gwadar will become an international port, he says. When asked about Gwadar’s persistent water woes, Hijazi mentions a fancy water-conservation scheme that is hard to find in the town. “One thing I have witnessed myself is that each new sector of the city has recycling plants for all the water it uses,” he claims. The government has spent 400 million rupees, he says, using international consultants “to ensure that no water flows into the sea and that wastage is eliminated”. Hijazi’s unguarded and unqualified optimism echoes in every government chamber in Islamabad. 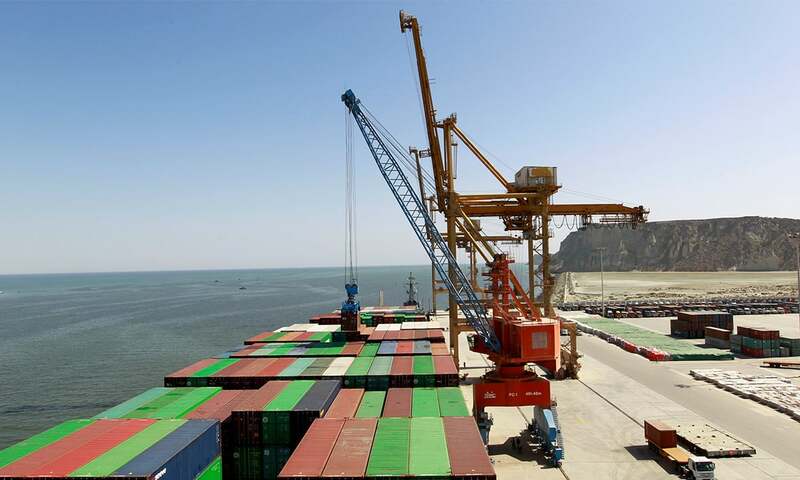 Senior government officials say the official strategy to implement CPEC projects in Balochistan is based on three elements — increased mobility, increased connectivity and the spread of technical and managerial education among the Baloch youth. He rejects the criticism that only 1.5 billion US dollars are being spent in Balochistan from the financing available under the CPEC. “There is an allocation of 1.5 billion US dollars for Gwadar alone. So to say that there is an allocation of 1.5 billion US dollar for the whole of Balochistan is not correct,” he says. He mentions many projects – power plants in Gwadar, Hub and Gadani, for instance – to claim that their cost alone is nine billion US dollars. In November 2016, Iqbal took another delegation to Gwadar. “I was told by the hotel’s manager that there was 100 per cent occupancy and that they are constructing a new block.” That shows how business activity is increasing in Gwadar, he says. “There is a network of six-lane and eight-lane roads in Gwadar [town]. There is a technical college there and a university. A hospital is under construction with China’s help,” he rattles off details about new developments in town. The Gwadar of official imagination, as portrayed by Ahsan Iqbal, was on full display on November 11, 2016. “The first trade convoy carrying Chinese goods for export through the western route” and “a Chinese ship” arrived at the town’s port that day, daily Dawn reported. 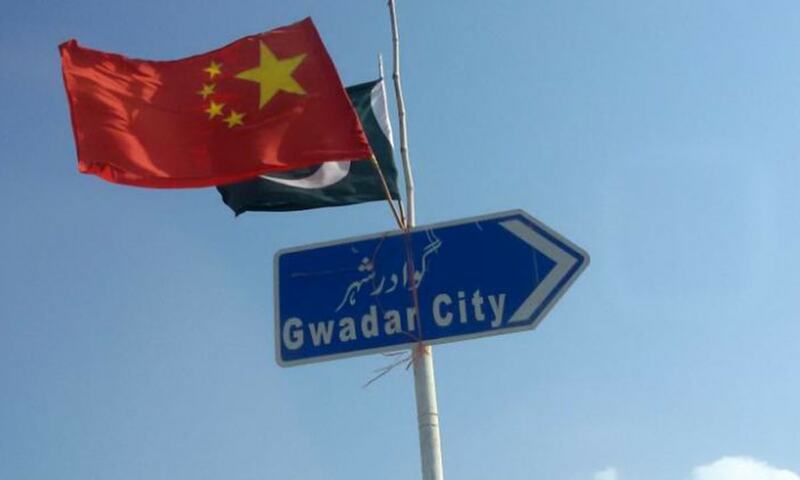 The Gwadar Yakjehti Council, a small group of local businessmen, former political activists and freelance agitators, took out a procession in support of CPEC, Dawn said. Its participants “termed CPEC a game changer for the region, especially Balochistan, as it would bring about progress and prosperity”. The newspaper quoted one of them saying that they “are happy that Gwadar is at the centre of CPEC because this will remove poverty and create jobs for the local people”. The participants “praised the role of the Pakistan Army and said the corridor could not have been completed without the support of the armed forces”. 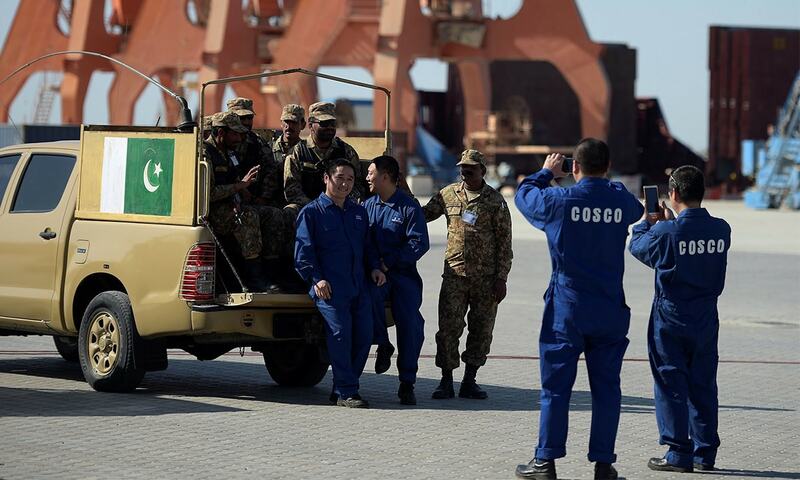 Pakistan’s political, military and bureaucratic elite, along with foreign diplomats, businessmen and mediapersons from Islamabad, Lahore and Karachi descended on Gwadar two days later. At a glittering ceremony, Pakistani and Chinese musicians sang of the long and deep friendship between the two countries as more than 350 guests listened, some of them clapping. Prime Minister Nawaz Sharif, former army chief Raheel Sharif, Chinese ambassador to Pakistan Sun Weidong, NP President Hasil Bizenjo, Balochistan Governor Muhammad Khan Achakzai and Balochistan Chief Minister Sanaullah Zehri were among the most prominent participants at the ceremony. “ … this day marks the breaking of the dawn of a new era,” Nawaz said in his address on the occasion. 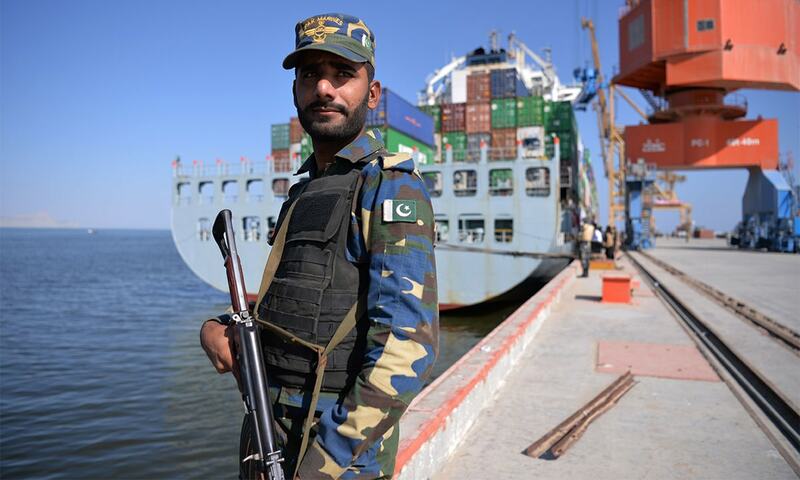 The Gwadar of reality was also visible on the sidelines: each truck in the convoy was scanned thoroughly before it was let into the port; guests were cordoned off by two layers of men in uniform. Outside the venue of the ceremony, the already high security was raised even higher on all entry and exit points to the port area. Marine Drive was blocked for all traffic except the official one and local fishermen were told to stay off the sea. The most visible Gwadaris around were about 100 schoolchildren brought to line the approach of the marquee where the ceremony was being held and shower the arriving guests with rose petals brought from outside Gwadar. Inside the marquee, local residents were not more than 10 per cent of the participants. Many local residents who had received invitations to attend the ceremony were, in fact, disallowed entry at the last moment due to security concerns. The ‘shining’ Gwadar of official description seems like a mirage — one that haunts the town’s residents amid security cordons, poverty, illiteracy, and economic and political marginalisation. This article was originally published in the Herald's February 2017 issue. To read more subscribe to the Herald in print. The writer is a staffer at the Herald. Additional reporting by Umer Farooq, Saleem Shahid and Danyal Adam Khan. Some hopes and more fears . . .
Gwader should make provisions for an underground mass transport plan now before it gets built all over the area. No fear when CPEC is here. Pakistan on the right track . Such a long article. Would need 2-3 days to read. But I will read though. I congratulate Mr. Maqbool Ahmed on a well researched and written article. I am Indian and have very little information about CPEC and Gwadar, yet this article brought to life the real issues of the local population. I hope and pray that this development brings aman and shanti to the local people and that the fruits of the project are not all swallowed up by the Chinese. Looking forward to more articles like this, Mr. Ahmed. CPEC will change the face of Pakistan. It will be huge. Looks like the electricity and water problem needs to be fixed before more ambitious tasks are taken on. No comments yet?! Given how sensitive the subject matter is, I am guessing it will stay that way. Very well researched and well-written article, though. Great journalism, once again, as we have come to expect from Dawn and The Herald. Chinese goals are clear, work with China on economic progress or you will disappear. This is how China was made modern. On top of that image of a Islamic looking g person with weapons killing people will draw more condemation. excellent balanced article, hope CPEC bring promised prosperity and peace to Pakistan and subsequently whole of south asia. The article puts down well that the the basic needs such as water, electric current, health and educational facilities and the relevant industrial and transport tools , are essential for the success of any entreprise. Congrats Pakistan "He expects the town’s population to reach one million people in the next five to 10 years “and about 0.9 million of these will be Chinese”." The article veered into a different subject halfway through. No doubt Indian Chaps are cheering in the comments section. I am amazed at the free press Pakistanis enjoy. In India we can never even dream of writing this kind of stuff about the most beneficial project for the country. We eliminate dissent, swiftly. @Shahid - A good suggestion indeed. Anyone there to pay heed to this? One more area you should also focus on while building the infra capabilities . Skilling of local population is necessary to take maximum benefit out of the project . Not a balanced approach.Though,well researched but lacks ground realities and policy decisions. "Honourable"!! !............If being prime suspect in floundering public trust and accusations of amassing wealth by corrupt means and then transferring it through mediums defined by law as money laundering is something honourable then please redefine honour and explain what is dishonourable. May I request a correction. "He points out that a government technology college has already been established in Gwadar to benefit the local people (though it has not started functioning yet)". Der sir I am the Principal of GIT. The College started functioning years ago. Our senior batch is in final year of 3 Years diploma in Electronics and doing Internship at Jolta Intl (An electric car assembling factory in the free zone). All final year students have assured jobs. Moreover, over 400 persons have been trained through short courses as skilled workers. Please check ypur facts. Very informative article. Let the Baloch people as well as other Pakistani people get the fruit of the development in right way. May God bless the people of Pakistan to flourish economically like anything in future. India would like to see a economically developed Pakistan for its own interest. With best wishes. @INdian Guy dude our Indian press is compltely controlled by the west.